As I mentioned Wednesday, I’m bringing back some old (or recurring) favorites in an effort to stick with my budgeting goals this year! 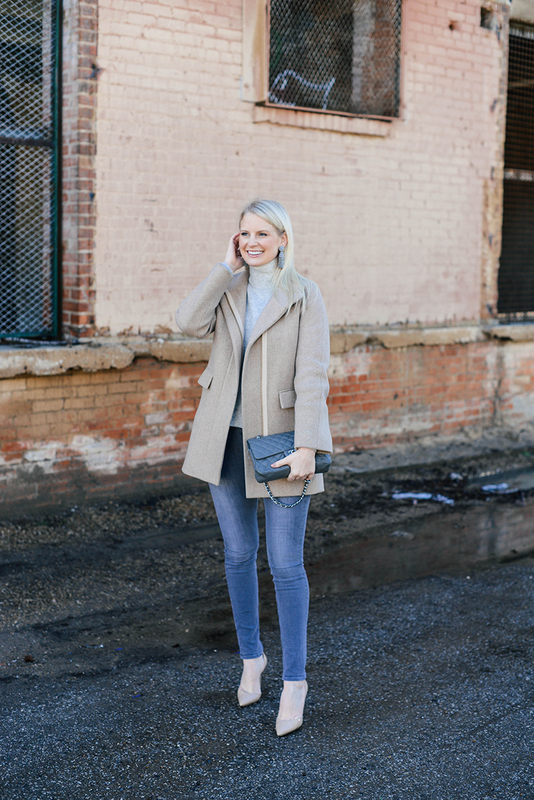 Here you’ll see several oldies-but-goodies, like this J.Crew coat I purchased back when I hosted a J.Crew event in November 2012. That seems like so long ago, but it’s been such a popular style, it became a classic that’s been restocked year after year. Another item I was excited to resurrect is this pair of grey skinny jeans I purchased about this time last year! The reason why it’s being “rediscovered”? I separated my spring/summer denim from my fall/winter denim, mostly by color, and for some reason this pair ended up staying in my summer pile in another closet. When I’m feeling the need for a change, grey jeans are a fun and fresh update I can quickly add to create an entirely new color palette. This time of year I get so used to wearing black jeans and blue jeans, so it’s nice to spice things up with a more unique hue. Finally, these Manolo Blahnik heels have been a longtime favorite of mine. The d’Orsay silhouette lends a graceful air to an already sophisticated pump, don’t you think? While they are high heels, they’re actually easy to walk in. 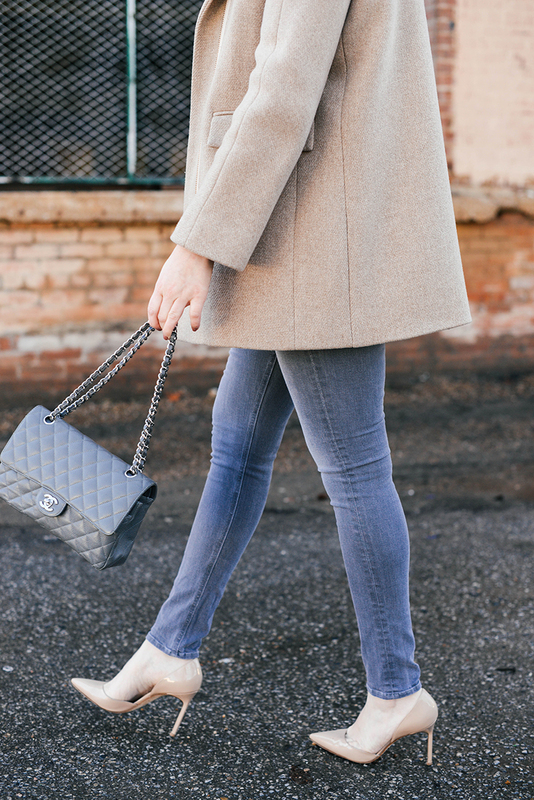 These heels have been the answer for those bridal luncheons, baby showers, charity functions and afternoon weddings you have throughout the spring summer months, but I love wearing them with jeans just as much! I’ve actually worn them so much I needed to have them re-soled last year, but they still look brand new. A classic shoe like this is definitely worth the investment. 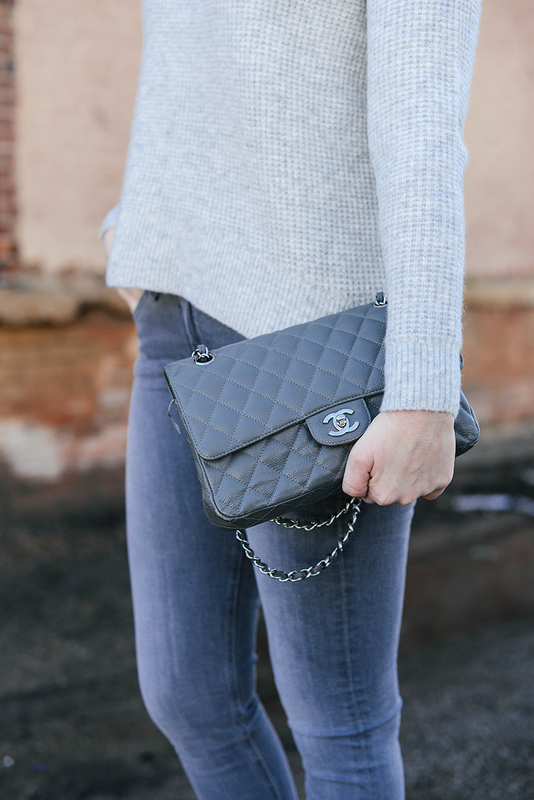 Really, the only the new item I’m featuring in this outfit is this comfy wafflestitch sweater! I love the subtle variation of texture, and the soft grey shade is the ideal transitional color from winter to spring. 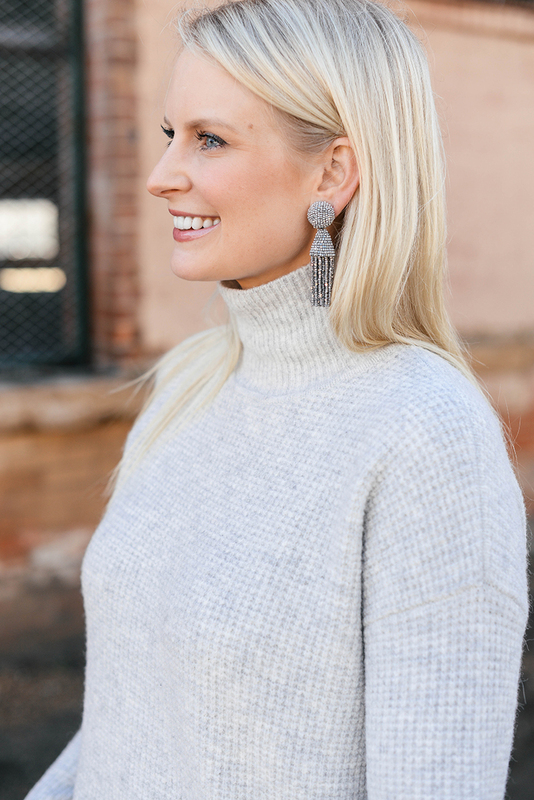 With the way our winters have been here in Dallas this season, I’m sure I’ll be wearing this under $100 knit with white jeans and cute flats in no time at all! these pumps are so classic, love this look. You just reminded me that I need to bust out my grey jeans! I love that color. It really is a classic! You always have such great neutral looks! I love this outfit. Love the heels! So classic! That waffle knit sweater is too perfect!! A lot of classics in one outfit, my favorite!